Super pretty and delicate but not overly precious. Looks great with a warm wood table. I'd highly recommend this runner--the linen is of wonderful quality, and the teeny tiny pompoms are just the right subtle bit of simple adornment. Table runners are so multi-functional. They're the basis for a decorative masterpiece. It not only protects your table from potential scratches, dents and spills, it brings elegance to any dinner party. This oblong-shaped pom pom table runner brings style, too. 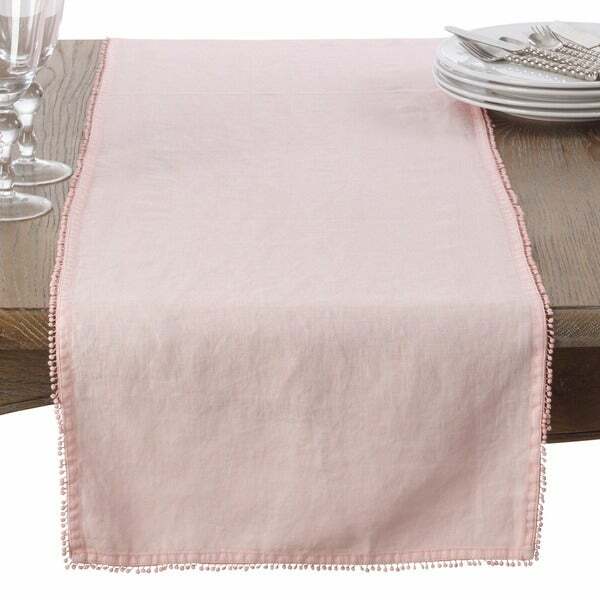 Made of 100% linen, its deep and rich color also gives your table a little pizzazz and complements any dining room. A fabric table runner comes in handy because you can wash it, fold it and store it for your next gathering. This table runner drapes quite nicely, and it'll have your dinner guests in awe. Dimensions 72.0 In. X 16.0 In. X 0.25 In. This looks great on my dining room table. This is a lovely runner, it is delicate yet bold and the pom poms add a touch of classy whimsy (if there is such a thing ha!) We got the blue one and the color is dark but not navy. Love it and recommend it! Love the fabric...unfortunately ordered the wrong color.